QBQ! believers know that IQs like these lead to Victim Thinking, Procrastination, and Blame. 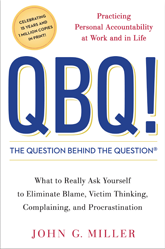 They also know that asking The Question Behind the Question (QBQ) is the way to eliminate these traps. 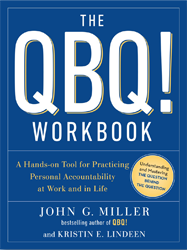 QBQs such as, “What can I do to solve the problem?” and “How can I contribute?” make the difference. This is all good. Have you heard something like, “It’s better to give someone a hand up than a handout”? Well, contrary to societal opinion, it’s not a mean or cruel statement. It’s wisdom because it strikes at the heart of human nature. Sure, there are times to give freely to people in need because we’ve been so blessed. I believe we’re called do so and I bet you do just that. Even in a difficult economy, organizations must hire. And though “recruiting, interviewing, and selecting” is always important, it’s even more so when times are lean, mostly because the available margin of selection error is slimmer. Said differently: We just can’t afford any hiring mistakes! Hey, a new acronym—the SPC! If we didn’t have the home office getting in our way, we could make more sales! 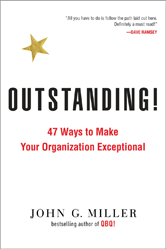 If you’ve read Outstanding!, then you know all about the “47 ways to make your organization exceptional.” If you haven’t, here’s the list. Our Colorado land-line and Internet provider is CenturyLink. They do a fine job for us, but I don’t go around raving about them. I have better things to do. However, I will take the time to extol the virtues of Mike, because people like him are the key to organizations being outstanding. So, we did. Overall, it’s been great, except for one thing: the DSL. Yes, even up in the mountains—I. Want. My. Internet! Since this post was first published, due to”popular demand,” we turned it into a wall poster for your organization! 1. 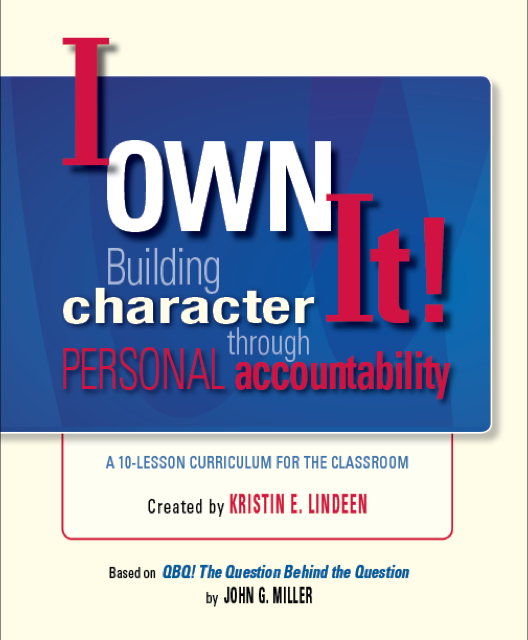 Everybody wants everybody else to practice personal accountability. Enough said. 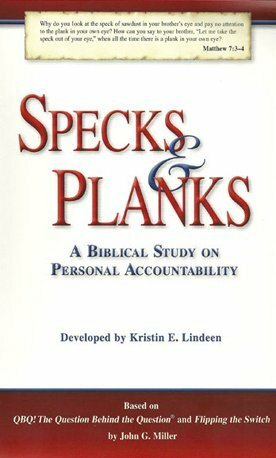 Accountability: Flying Higher Is MY Job! I always enjoy speaking at a client event, partly because I love to sometimes be a contrarian. Okay, who am I kidding—I love being “contrary” a lot. Karen and I even love to raise contrarians! I mean, who wants to be a lemming? Truth be told, when any of our QBQ! 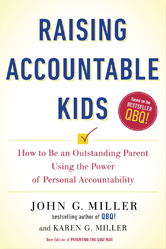 speakers arrive at an event, they already have “contrarian” stamped on their forehead because our sessions are titled “Personal Accountability and the QBQ!” And I think Kristin, at age 30, is especially contrary. 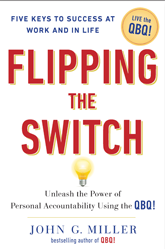 How much more of an upstream-swimming salmon can one be than to be a Millennial and teach PERSONAL ACCOUNTABILITY in this blame infested and entitlement laden society? But enough about us, really. What about the QBQ! material? What does it do for people and where does it apply? The Absolute Secret to Goal-Setting! 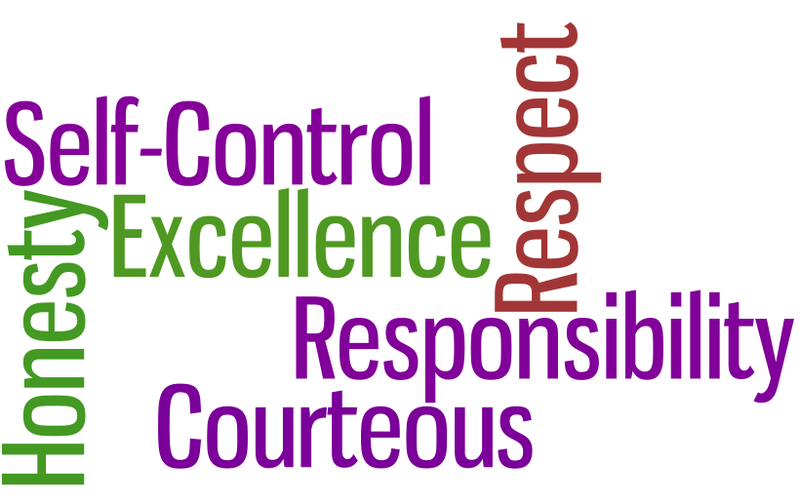 Most of us have seen the criteria for effective goal-setting. 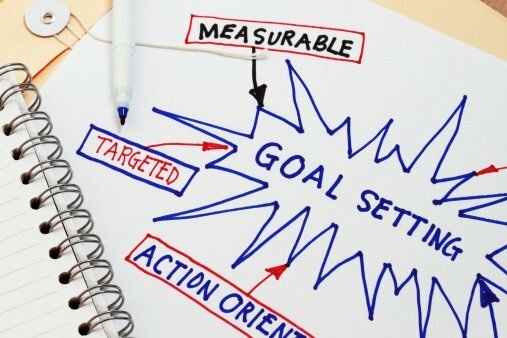 You know, goals must be specific, measurable, attainable, realistic—all with a targeted time frame for getting there. I didn’t set out to marry the perfect woman for me, but it happened. I didn’t set out to have 7 great kids—responsible, kind, non-entitled, hardworking—but have been blessed with them anyway. I didn’t set out to “make it” as a keynote speaker, but I guess I have. I didn’t set out to be debt-free, but we’ve been blessed. Much credit goes to Larry Burkett and Rob Blue, whose teachings we employed 25 years ago. (Yes, all of you debt haters, before Dave Ramsey! Karen and I didn’t set out to write a parenting book, but—phew!—we got it done. And, I admit, I didn’t plan to lose 43 pounds since April 11, 2012—but they’re gone.